Riveting is all the rage and we have a new class that highlights this super technique. Watch it as an online video class. Just log into your account from any computer and watch it anytime, anywhere. Or choose the DVD option to play on your computer or TV. In her signature peppy style, instructor Tracy Stanley teaches how to shape and size a ring band, punch holes in metal, use eyelets and make your own wire rivets. Samples of Tracy's patterned discs. Cool, huh? And we are super excited about her special technique for making impressions on metal without the use of a rolling mill. 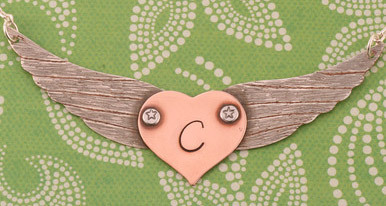 It's so easy and so effective, you'll want to pattern metal for your other stamped and riveted projects. Look at all of the lovely ring samples from class. You can personalize your ring in a variety of ways. 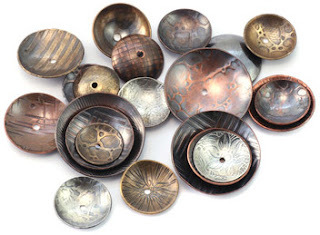 Add a variety of metal shapes and textures and an interesting focal bead. Our General Manager Claudia Navarrete, jumped in and took the class. She said, "I thought it was a great class. I honestly had not riveted before and I am totally confident now and I know I can do it. I am making rings for Christmas for sure...all my family members are getting one." Here at Beaducation, it's no surprise that we are in a frenzy over rivets. Not only is Tracy's new class great inspiration, we have also compiled a bevy of riveting resources just for you. Our Design Ideas have a section dedicated to riveting, including this stunning pendant with a mix of riveting, stamping and engraving. Introduction to Riveting as an online class or DVD. And check out our shop for riveting tools and supplies. Whatever you choose, we know that you will find riveting as much, as well...uh...RIVETING as we do! Thank you so much for sharing this great video. I know that there are a few different ways you can rivet and join metal elements together and you give a great introduction to the beginner. It is sometimes a little intimidating but once you learn the basics your design possibilities are endless.